There is a 600 files update, most of them are sprite files. The lag is just horrible. I am getting a 100% packet lost. Good job delivering the collected money. Now go and rest. Today GodOfMagic (also known as Briel, HelloKitty) tamed 4 black elders (Caspa, Sema, Baltuzar, Merkyor) and a Necromancer. And then, he released some of them and mainland town has turned into a mess. Some people managed to kill the necromancer, but some people heal it and someone even velox it over and over. Necromancer is level 40, with 350 hp and 350 mp. His lightening took me about 30hp. Some people died, because they are not bewared that a necromancer would come up from nowhere in town. The server has been down for awhile. Some players such as BlueTree lost her +6 katana for no reason after server crash. If anyone also lost item please email admin, but the chances of getting it back is minimal. New update you can stack gems, scrolls and potion together to save space and storage cost. However, sometimes you will lose all but one item in stack because of a bug. You cannot create a new account now. Many potential customers are complaining about it. Elven Long Sword required only 50 archne's web, 1 body of long sword and 150 lump of pure mithril. However, you can't make this yet. 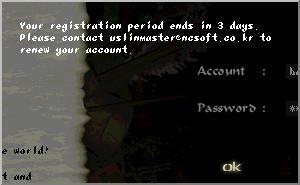 All account registered before November, 1999 is going to expire in 3 days. Please email admin for extending your account. There is still no word about commercial service yet. Account registered after November 1999 will expire after 90 days of the day of registration. The update also fix the teleort bug. You can't teleport anywhere you want by editing the text file now. 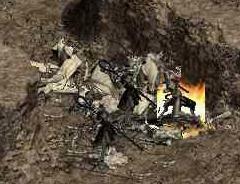 An elf sacrificed in a magic circle. Nothing much to say. No update, no special event, only lag. New NPC allow you to teleport between towns. The crashing bug has been fixed and a small update followed. New NPC Steve, Stanley, Lucas can teleport you between a few fixed destination. For example, a trip from Island to mainland is 1500 adena. It is more expensive than taking the boat, but you can arrive there instantly. Currently NCSOft only has the korean text, but I have translated to an English version. Click here to download it and extract this zip acheive into /text directory under your Lineage folder. Now you can store 100 items under dorin, thram and karim. New item requirement is finally being implemented T.T Now you need more raw material for making elven chain mail, bless of elm, elven plate mail, bracer. Please refer to the guide below for updated procedure in making items. Most ent lives in East, pan lives in south, archne lives in west, fairy live in north of Elven Forest. Kick/punch ent until it gives you 3 bark of ent. Hunt for 5 lump of rough mithril in elven forest/cave. Trade 5 lump of rough mithril for 100 lump of pure mithril from fairy. Kick/punch pan until it gives you pan's mane or it speaks. You need 20 of them. Talk to Archne and trade 20 pan's mane for 20 thread. Talk to Archne and trade 100 lump of pure mithril and 20 thread into 20 mithril thread. Go to Nerupa and make it. Kick/punch ent for 12 bark of ent. Get 30 lump of rough mithril from monster in Elven Forest. Kick/punch pan for 80 pan's mane. Trade 30 lump of rough mithril for lump of pure mithril from fairy. You should be able to get 600 of them. Trade 80 pan's mane for 80 thread from archne. Trade 12 bark of ent for 4 ecdysis of archne from Archne. Trade 1 thread and 5 lump of pure mithril for mithril thread from archne. you need 80 of them so you need to prepare 80 thread and 400 lump of pure mithril. Trade 50 lump of pure mithril and 1 ecdysis of archne for mithril plate from pan. You need 4 of them. Kick/punch ent for 24 bark of ent. Kill monster in Elven Forest to have 125 lump of rough mithril. Kick/punch pan until you get 20 pan's mane. Trade your 24 bark of ent for 8 ecdysis of archne from archne. Trade 125 lump of rough mithril for 2500 lump of pure mithril from fairy. Trade 10 lump of pure mithril for 1 oriharukon from Fairy Queen. You need 240 oriharukon so prepare 2400 lump of pure mithril. Trade 30 oriharukon and 1 ecdysis of archne for 1 oriharukon from pan for oriharukon plate. You need 8 of them so prepare 240 oriharukon and 8 ecdysis of archne. Trade 20 pan's mane for 20 thread from archne. Trade your 100 lump of pure mithril and 20 thread into 20 mithril thread. Buy a top quailty diamond, or hunt Elder/golem for it. Kill monsters in Elven Forest until you pick 83 lumps of rough mithril. Kick/punch pan until you get 150 pan's mane. Kick/punch ent until you get 9 bark of ent. 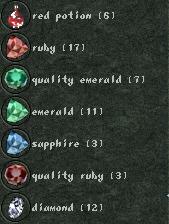 Trade 83 lump of rough mithril for 1660 lump of pure mithril from fairy. Trade 150 pan's mane for 150 thread from archne. Trade your 750 lump of pure mithril and 150 thread into 150 mithril thread. Trade 10 lump of pure mithril for 1 oriharukon from Fairy Queen. You need 90 oriharukon so prepare 900 lump of pure mithril. Trade 30 oriharukon and 1 ecdysis of archne for 1 oriharukon from pan for oriharukon plate. You need 8 of them so prepare 90 oriharukon and 3 ecdysis of archne. Buy a best diamond, 2 emerald, 3 sphaire, or hunt elder and caspa for it. Buy 5 magic gem or hunt monsters like skeleton. Buy Elven Lether Helm, or hunt shelob for one. Some other NPC (a lot) will be implemented later. When you walk into some specific points, your character will crash and you can't login to that character anymore. This bug appears after the server down for 4 hours yesterday. To avoid having you character crash, avoid walking behind Luth, old karim place, and the route between Pandora and Dorin. Also using verr scroll will make you crash as you go back to town as well.